Weight Item: 29 lbs. Case Pack: 174 lbs. Models beginning with "13" are subject to a fee of $50.00 when the total of all "13" models is below $715.00. 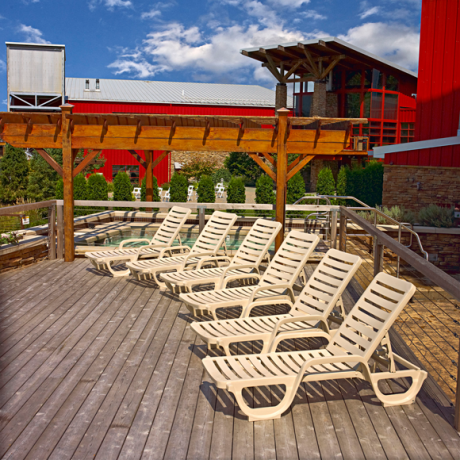 The Bahia chaise lounge has a 4-position adjustable back and a built-in safety guard to prevent injuries to hands. It is stackable and easy to move. This chaise lounge is ASTM Rated to 300 lbs. 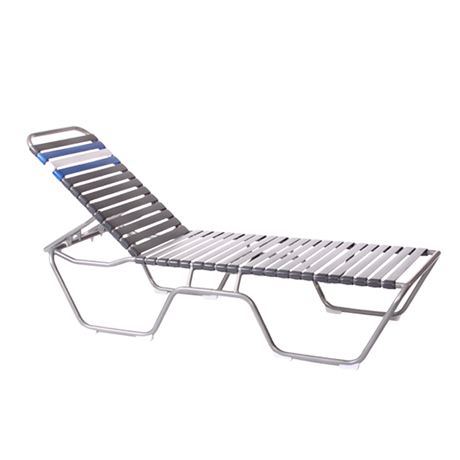 It is manufactured with rounded edges for safety and its construction makes this chaise lounge impervious to salt water, chlorine, and most common stains. 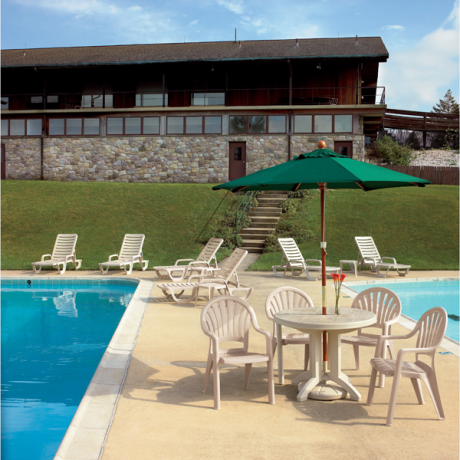 It is available in a white or sandstone finish and is specifically made for commercial use. With twice the resistance to U.V. 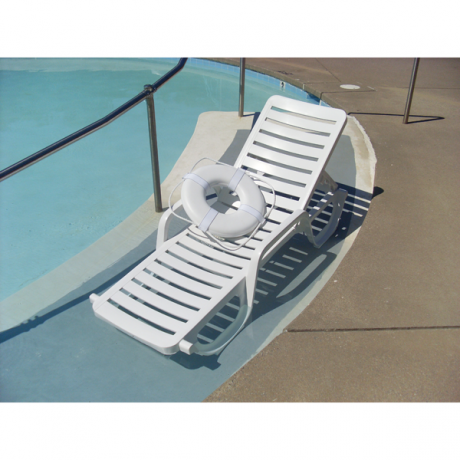 degradation than an ordinary market chaise, the reinforced slats and frame create extra support and the recessed roll-away wheels allow for easy mobility and quick storage. Cushions are also available for the Bahia chaise lounge, call our account managers for more information! Grosfillex, Inc. manufactures its resin furniture from first quality raw materials and according to the most advanced standards of manufacturing process available. Grosfillex warrants its Contract furniture to be free from manufacturing defects in materials or workmanship when used, maintained and stored under normal commercial use. This warranty applies to the original buyer from the date of purchase. The warranty period is three (3) years for All Weather Wicker JAVA, CALYPSO, BAHIA, NAUTICAL, CATALINA, AND MARINA chaises. This warranty is limited to the repair or replacement of those products or parts of products which Grosfillex finds and accepts as defectively manufactured during the warranty period, at no cost to the original owner. Replacement products or parts of products are warranted only for the remainder of the duration of the original warranty. Further, Grosfillex will replace product under warranty in a quantity prorated to the remainder of the duration of the original warranty period. In the event that the exact model of the defective product is unavailable, Grosfillex will replace it with a comparable product. 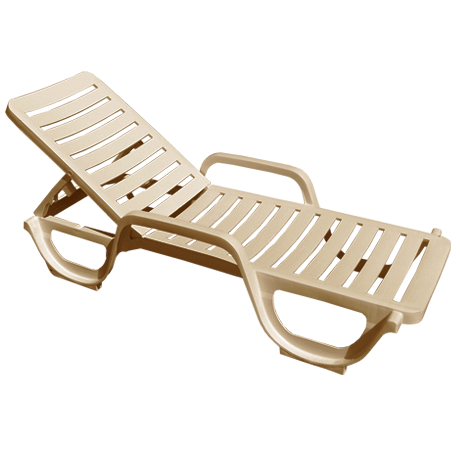 If the resin frame or backrest of the NAUTICAL, CATALINA, or MARINA chaise fails structurally or discolors under normal usage within three (3) years from the date of purchase, Grosfillex will repair or replace the frame or the backrest of the chaise without charge. (Parts and labor included.) In addition, Grosfillex warrants the fabric of the sling chaise for a period of three (3) years against tearing. In the unlikely event that the fabric of the sling chaise tears under normal commercial use, Grosfillex will replace the fabric at nor charge to is customer. (Labor not included.) Grosfillex warrants the fabric of the sling chaise one (1) year from the date of purchase against discoloration or fading due to the sun’s ultra-violet rays. This warranty does not apply to color changes due to staining. For more information on this matter, refer to the cleaning instructions provided by Grosfillex. 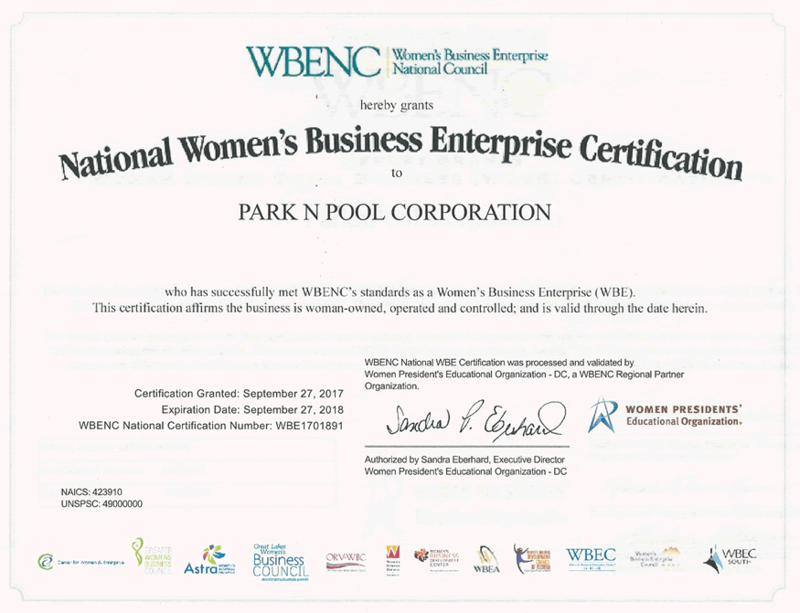 Specifics about this limited warranty can be obtained by contacting ParknPool. Any implied warranty of merchantability or implied warranty of fitness for any particular purpose shall be limited in duration to the warranty period of the specific product from date of purchase. Some states do not allow limitations on how long an implied warranty lasts, so the above limitation may not apply to you. Grosfillex shall not be responsible for any loss, damage, expense or incidental or consequential damages of any kind arising out of any defect in Grosfillex products. Some states do not allow the exclusion or limitation of incidental or consequential damages, so the above limitation or exclusion may not apply to you. This warranty does not extend to goods which have been damaged, altered, abused, misused or repaired after leaving Grosfillex facilities, or which have been repaired or otherwise altered in any manner outside of such facilities, unless previously authorized in writing by Grosfillex.